When visiting the Shuswap region for golf, don’t miss out on Shuswap National – picturesque, challenging and fun. 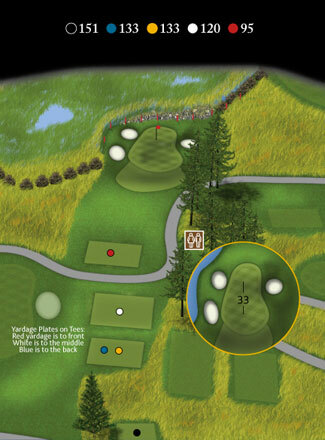 The unique and eclectic 7100 yard design brings you a bit of the British Isles (open fields of long fescue and grass-faced pot bunkers), forested areas, rock outcrops, natural wetlands, and striking water features. Our spectacular and immaculate bentgrass greens are often fast, always roll true and are very receptive to approach shots. Subtle undulations add to the enjoyment and challenge. Our course conditions are often superb. For example, in 2011 we were voted the best manicured and conditioned destination golf course in British Columbia. It is not unusual for our patrons to remark emphatically about the quality of our greens in particular. The scenery of the site, to many, is awe inspiring! 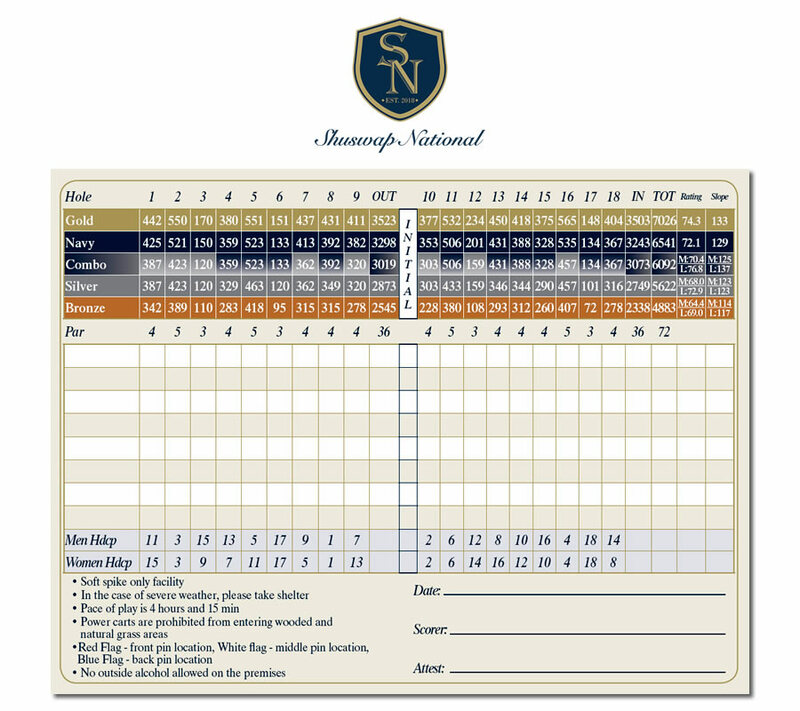 When in Salmon Arm or the Shuswap, don’t miss Shuswap National. We’re a gem worth finding. From breathtaking scenery to challenging golf to exceedingly friendly hospitality, you will fall in love with Shuswap National. We are going to start you off with a straight-a-way par 4 using Bastion Mountain as a picturesque backdrop. Your tee shot will take you to the bottom of a swale and leave you with a short uphill iron shot to a long narrow green. 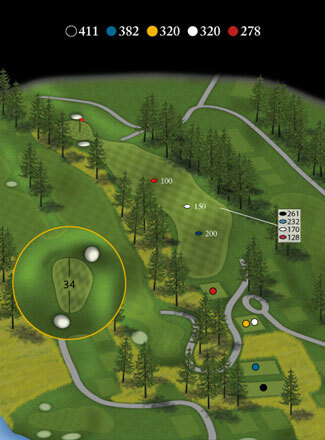 This green is situated on top of a knoll so a miss left or right will not be favourable. This hole doglegs to the left and then back to the right. When you come from number 1, you have to turn right and drive back to the gold, blue, and PGA tees. The driving distance line is on the 250 yard marker. Before your second shot you might want to drive up and have a look as to where you want to hit this next shot, a picture is worth a thousand words. All of out par three’s have three yardages on the tee head plate, this means red is the front of the green, white is the yardage to the middle of the green and black means the back of the green. While on number 3 tee look down at number 5’s tee off landing area. How much do you want to cut the corner? This is the shortest of the Par 4’s on the course. Two smallish pot bunkers on the right side of the landing area and a very large tree to the left require a controlled tee shot if you are to have a good shot at a raised green. Be careful – two very deep pot bunkers guard the left side of the green. Another Par 5, another chance at birdie… Three large bunkers protect the left side of the fairway, and not visible from the tee is the pond that you encountered on the 3rd hole. You will have to consider your tee shot carefully. Deep fescue defines the right side of this undulating fairway. 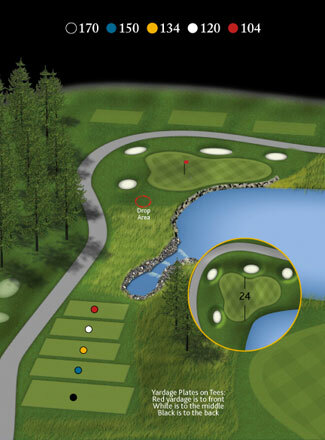 The elevated green is wide but shallow and is bunkered at the front and back. The second Par 3 on the front nine is short in yardage, but not short of potential danger for an errant tee shot. The marshy area that borders the green left and long makes a front pin placement more accessible than a placement that is deeper in the green. After you tee off, take a look to your right. 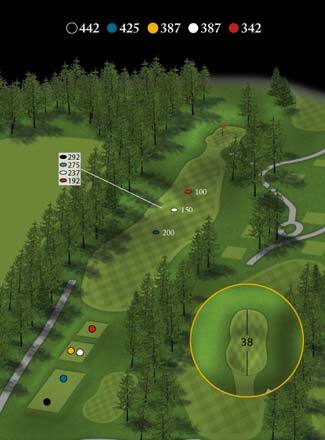 Number 8 green is just above you, the 150 yard marker is half way down the hill, the fescue on the right hand side starts at 110 yards and if you are on the left side, will be blocked to the green by the pine trees. Considered the most difficult hole, course management will be the issue here. With trees left and right and a huge indentation in the fairway, some serious calculation on the tee will be needed to leave a reasonable approach shot onto the elevated green guarded by a huge bunker to the right. Once again the swale comes into play on this hole.The landing area is generous, but because this is a dogleg left, a right-of-center tee shot will be preferable. The green is large but undulating and banked right and long by a gently sloping hillside. The left side of the green is the opposite; it slopes away from the playing surface. Arguable the prettiest hole on the golf course, this Par 4 will require your utmost attention. A series of ponds and a creek meander their way along the left side of the green and gently work their way down the right side of the fairway. 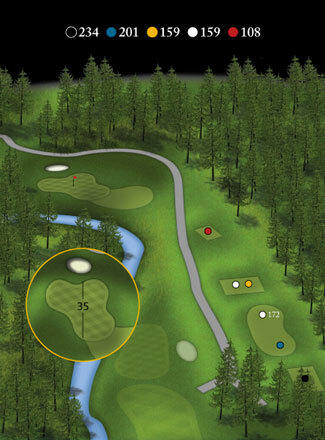 This hole is uphill from the tee to green which will influence your club selection. 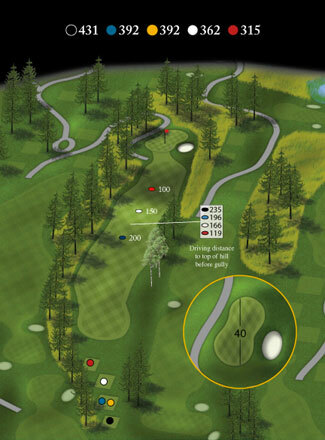 Unique features are the theme for this dogleg left Par 5. 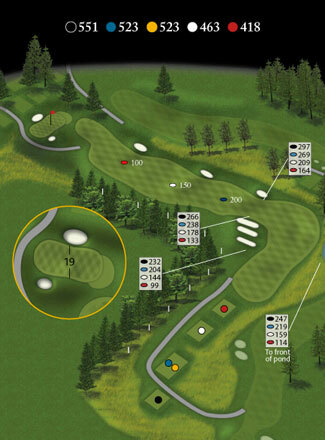 Your tee shot should be well to the right of the colorful rock face that is evident from the tee. Canoe Creek makes its way across the fairway and continues down the left side of the hole. The green is on the small side and protected left, right and long by bunkers and deep rough. Canyon left, forest right and a green situated in the middle of the hillside make this Par 3 the most difficult you will encounter here. Lots of carry involved as the tee boxes and the green are both elevated. Amazing vies will greet you when you arrive at this tee. The fairway is situated some 200 feet below, with Canoe Creek winding its way down the right side tree line then crossing the fairway in front of the green. This dogleg right will test your skills as the green is again wide but shallow, and a right pin placement will give you more green to shoot at. We are now back into the links-style format of the golf course with a straight-a-way Par 4 guarded on the left side by a lake. Also protecting the left side of the green are 3 very deep pot bunkers. The green has an unusual shape to it, making putting challenging. This hole is a little tricky, but not overly difficult. The marsh comes back into play as this small green is almost completely surrounded by deep rough, bullrushes and marshy ground. An accurate tee shot and an accurate second shot are a must here. This is the last and the toughest of the Par 5’s because it is so narrow. You have to be aware of the out of bounds on the left, and the natural grasses that have been predominant throughout the course also appear on the right side of the fairway. The first landing area is reasonably accessible but the fairway narrows to the green. The green itself is two tiered, higher in front and lower at the back. 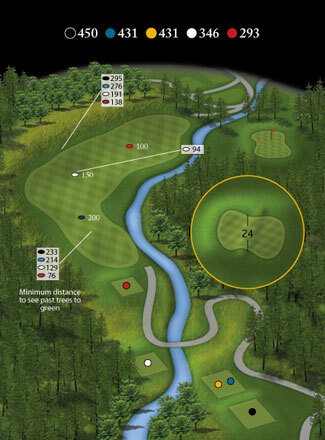 With out of bounds left once again, and the creek right, this Par 3 will test your nerves. This is a pretty little hole and features a stone bridge you will have to cross to access the green. Great finishing hole! Coming out of a cute from the tee, you will have to deal with the lake to the right and the trees to the left. This hole is uphill all the way. 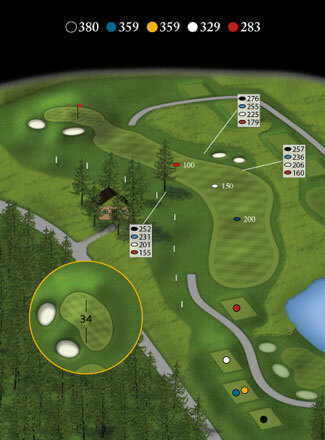 The green is large, but protected on the right by a large, deep, links-style bunker.